We have recently been to Edinburgh and we have had a jolly old time, There is so much to see and do there, we barely even scratched the surface, so I feel that a future visit is definitely on the cards. 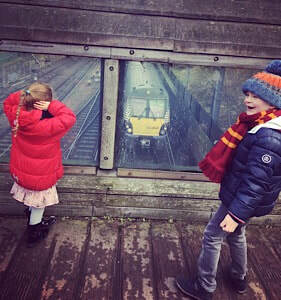 The Child’s favourite thing that we did in Edinburgh was to wave at the trains. In Princes Street Gardens, at the castle end, near the playground and the Ross fountain, there is a footbridge which goes over the train tracks. This bridge has perspex sides so you can see the trains coming into and out of Edinburgh. What makes this especially fun is that if you wave at the trains as the pass by, they will normally honk their horns! There is a kiosk near the playground selling ice-creams and coffees with a toilet nearby and the gardens are lovely to walk through, so a very enjoyable way to spend a few hours.